We are reputed specialist installers of commercial security alarm systems and monitored alarm systems in Bolton, Manchester, Salford, Eccles, Oldham, Worsley, Wigan, Warrington and the surrounding areas. The security systems Mono Fire and Security install are designed to protect high value properties and businesses where design flexibility, product performance and integrated solutions are a priority. A tailored security system for your commercial property is key to ensuring you and your employees work in an environment that is both safe and fully prepared in the event of a break in. Mono Fire and Security are able to offer customers a secure system with the additional benefits of automation, smart management and flexible control, all from the established and familiar Premier Elite range of control panels. Protecting your property with the right level of security is vital to ensure the protection of your employees, valuables and livelihood. If you have a business or are in charge of your organisations security, its key that the right solution is designed, installed and maintained by an accredited security provider. Mono Fire and Security have over 25 years experience installing and maintaining commercial and domestic systems and are a NSI Gold registered organisation, meaning all of our work is carried out to the highest standards. Get in touch today for a no obligation quote of your business. As a recognised commercial alarm installers in Manchester and beyond, our commercially monitored alarm systems give you the peace of mind, keep your insurance company happy and can cost a lot less than you think to protect your business in the best way possible. Having a monitored alarm system gives you the peace of mind your business, employees and livelihood are protected all year round. In the event of an alarm activation the monitoring station will be notified and once they have confirmed that the activation is real, they will notify the authorities who will attend the site as soon as possible. 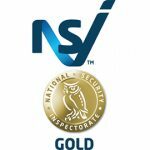 You can only ensure the authorities are notified if you have a monitored burglar alarm system, which has been designed and installed and maintained by an NSI Gold provider. What if there is a problem with my intruder alarm? If you have any problems with your alarm please contact our Service & Maintenance line on 0161 786 2645 where a colleague will be able to assist you 24/7. How do i arm/disarm my intruder alarm? There are four ways to arm and disarm your intruder alarm. You can do this via your control panel, just key in your alarm code into the panel to arm the alarm and do the same again to disarm. You can also use your remote key fob by pressing the button corresponding to the action you want to take or if you have a proximity tag, you can arm/disarm your alarm by presenting the tag to the reader. How long before an engineer will be at my property? What will happen if my power is out? Every alarm that we install has a battery backup which usually will last up to 8-12 hours depending on the battery charge. Are you a trusted security provider? We are a NSI Gold provider, meaning we fully comply to the National Security Inspectorate British and European regulations. This means all of our installed alarms are installed and maintained to the highest possible standards. Why is my alarm flashing red and green? We have multiple options available to make it as simple and easy as possible for you to pay your annual maintenance fee. Contact us on 0161 786 2645 to find out how we can help.